Last September I bought a new home in East Nashville. East Nashville is just over the river from downtown and is a work in progress. As soon as an old home is purchased, it is either renovated or torn down to make way for new construction. East Nashville is known as the cool part of Nashville. It is very transitional and the inhabitants are a collage of yuppies, hipsters and low income folk. My real estate agent turned me on to a great landscape guy who transformed my backyard into a wonderful stone and pebble entertaining area surrounded by planting beds following my fence line. Practically zero maintenance! 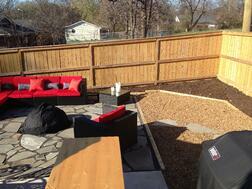 Below is a pic of my backyard before I planted. This past spring I took a drive to Bates Nursery to buy flowers, vegetables and herbs for my beds. I learned a few things. Though I love spaghetti squash, I will avoid the takeover of the backyard next summer. My two favorite things to harvest were berries and tomatoes. I had a solid month of blueberries followed by raspberries. I feel like my tomatoes lasted all summer long. My tomato plants remind me of marketing. Every day I went out, watered my tomato plants and picked the weeds. Marketing is pretty much the same. You must consistently tend to your market or target market. As it relates to catering, you must consistently use four walls marketing, cookie drops, trade shows, bridal shows, lead generation mail, client newsletters, email newsletters, birthday clubs, loyalty and referral programs, niche mailings, telephone follow up and tastings to get catering clients and repeat events. When the day came that my gardening paid off with my first few tomatoes, I couldn’t stop watering the plants or picking the weeds. The day I cut off the supply to that plant, the tomatoes would cease. Marketing works exactly the same way. Your catering business may not shrivel up today should you cease marketing, but soon it would. Dan Kennedy, one of my marketing mentors, makes sure he does at least one marketing activity a day. Even if it’s sending a single fax, he won’t end his day without some type of marketing. Recently I had dinner with my friends Jay and Terry Siff from Moving Targets. Jay and Terry met at the gym and are both are into their health. I asked Jay if he enjoyed lifting weights. He admitted he didn’t, but he knew he needed to do it. For me marketing is a joy. I love for the next marketing campaign or challenge. Winners do what they need to do, not just what they want to do. Whether it’s you or a key person, marketing must be a consistent activity in your restaurant catering business. People ask me what’s the one thing you did to build a million dollar a year catering business. There is no “one” or silver bullet. It’s the piling on of a million little things that lead to large sales. Please don’t forget marketing is far more than a sales letter or cookie drop. Marketing is the impact of small impressions on your prospect: staff, uniform, hygiene, punctuality, phone skills, etc. From my 30,000 foot high overview of what it takes to harvest more catering, this all sounds daunting and overwhelming. The road to a million dollars a year in catering sales starts with one action. Decide today you will focus on one initiative for thirty days. At the end of that thirty days add another marketing initiative to your plate. Before long you’ll be harvesting bushels of “catering tomatoes”.